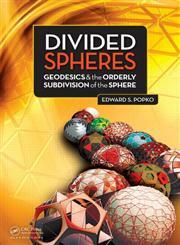 The Title "Divided Spheres Geodesics and the Orderly Subdivision of the Sphere 1st Edition" is written by Edward S. Popko. This book was published in the year 2012. The ISBN number 1466504293|9781466504295 is assigned to the Hardback version of this title. This book has total of pp. 532 (Pages). The publisher of this title is Taylor & Francis Group. We have about 143796 other great books from this publisher.